The Corporation of Delta splits its roads into three priority groups to ensure major routes get cleared first. Corporation of Delta snow plows are busy clearing the roads after snow returned to the Lower Mainland Feb. 3. Environment Canada has issued a snowfall warning for Metro Vancouver and the Fraser Valley. The forecast, issued just after 3:30 p.m. today, calls for five to 10 centimetres of accumulation caused by a low pressure system offshore. But as the snow begins to blanket the region, not all North Delta roads will get plowed immediately. 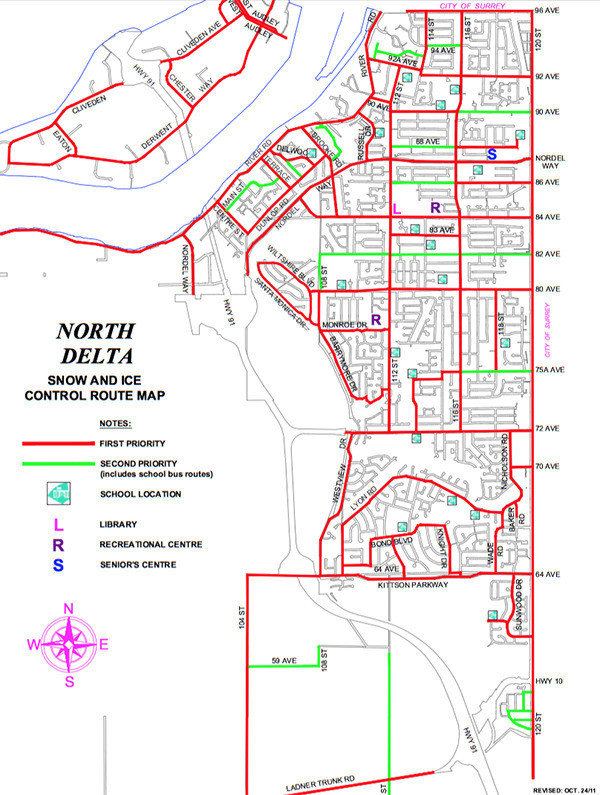 See the map above for the priority of your street or route home, or click here for a higher-resolution image that you can zoom in on. Public transit routes, major collectors, select school access roadways and some roads in hilly areas are given first priority, with sanding and snowplowing carried out as long as poor conditions exist. Overtime for municipal employees working these routes is automatic, so they will get done no matter what. “Second-priority” roads include secondary through-roads in residential areas and school bus routes. Overtime may be scheduled to complete secondary priorities, but is not guaranteed. The municipality has set up a “winter road conditions” phone line (604-952-3820) that is updated every four hours with the current weather situation and Delta’s response levels. This information will also be available through Delta’s Facebook and Twitter pages. • If possible, do not park your vehicle on the street or in your cul-de-sac. An empty street makes the passage of snow plows and salt spreaders much easier. • Do not attempt to stop the plow truck operators. They follow specifically laid out routes and are under the direction of the engineering department. Please direct all requests, comments and concerns directly to the engineering department at 604-946-3260 during business hours or to Delta Police at 604-946-4411 after business hours. • Walk on the left side of the road, facing traffic. On roadways where there are no sidewalks or the sidewalks are impassable due to snow, give the snow plows as much room as possible. Our drivers are courteous, but the equipment they are operating is large and complex. • Never shovel snow from sidewalks and driveways onto the street. The snow plows always push the snow to the side of the road. Accordingly, this may result in snow being pushed back onto your driveway rather than having it plowed away. Pushing the snow from your driveway onto the road will add snow and ice to the road, creating a hazardous situation. • Please shovel any catch basins if they are in front of your home. Melting snow can drain into the storm system and this will reduce the chance of flooding and icing in the street, as well as the chance of flooding on your property.